Chaverim was originally started in Brooklyn, New York in 2001. Today, there are over two dozen cities that have a Chaverim chapter. Although the mission of most Chaverim organizations in the United States remains mostly the same, each branch is independently run. CHAVERIM went live on September 1, 2011. Chaverim’s has three levels of response. Emergency, Non-Emergency, and Missing Person Searches. Emergency Response: Someone locked or stuck inside of a car or room of the house. Chaverim members are equipped and trained with sophisticated equipment in order to gain entry to a vehicle or a home within seconds. Non-Emergency Response: Among the variety of auto related problems, the most common are: jump-starts, gas outages, flat tire, and keys-locked-in-the-car (auto lockout). Chaverim is also equipped to gain entry into a home when the keys are locked in the house. Car stalled in middle of the street. We pulled him over to a safe location. Missing Person Searches: A critical facet Chaverim has embarked upon is “assisting in a missing persons search”. Hatzolah of Los Angeles remains the designated community resource when it comes to a missing person. On a number of occasions, Hatzolah and Chaverim have teamed up on a missing person incident. Most recently, on March 11, 2012 Hatzolah was contacted regarding a missing community member. 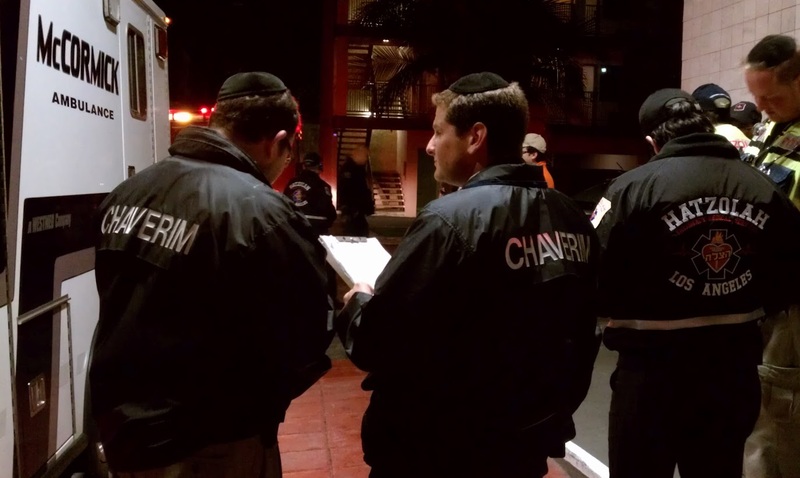 Hatzolah contacted Chaverim and the two organizations worked hand in hand as a “unified command”. Chaverim sent several volunteers to search designated areas. Additionally, Chaverim resources spread the word to the community for the immediate need of community volunteers. Chaverim was able to round up dozens of volunteers in a short time. The subject went missing on a Friday morning. Ultimately, it was due to the collaborative effort that the missing person’s car was found on Sunday night after he was lost and disoriented due to a head injury. The victim’s life was spared as a direct result of this collaborative effort, and of course the mercy of Hashem. Only two days later, Chaverim Founder, Ari Friedman, received a chilling phone call from Shomrim in Brooklyn, NY. The call was received at 6:15pm on March 13, 2012. The caller stated that his family member was in immediate danger. She had gone unconscious either during a phone call or shortly thereafter. The family member was unable to locate the subject. The police were called and they were able to “ping” a cell phone location to within 800 meters, (approximately 1/2 a mile radius). It was too large of an area for the police to investigate. Chaverim was in immediate contact with Hatzolah. Chaverim and Hatzolah once again setup a joint command. LA County Sheriff insiders were called and volunteers from Chaverim’s “Missing Person Search Group” were called up. Hatzolah brought their Mobile Command Center RV as well as their disaster Supply Truck which was used to generate light at the “command post”. Over two dozen Hatzolah and Chaverim members/volunteers began searching assigned grids. At approximately 11pm, the subject’s car was located. The unified command immediately notified the police. They responded within a few minutes. The local Fire Department arrived as well. Shortly thereafter the subject was found in the motel room where the car was parked. She was alive but in serious condition. Again, Chaverim and Hatzolah saved this persons life. To start, Chaverim offers a number of services that AAA doesn’t offer, for example, “home lockout”. Also, in the “emergency” setting Chaverim will typically have a response in under five minutes, and in most cases under three minutes. Call AAA during “rush-hour” (4-7pm), and see how long it takes for them to arrive. Chaverim is not in competition with AAA. We encourage you to call AAA if you are a member. Q: How long will it take for a Chaverim member to respond in a “non-emergency” call, such as a jump-start? A: Chaverim has members situated in the Pico and Hancock-Park/La Brea areas. 95% of the time, at least one Chaverim member is in your neighborhood and will be there within 5 minutes. However, in the rare event that a member would have to respond from another area, it could take up to 15-20 minutes. Q: How is Chaverim funded? A: Chaverim services are 100% free. At the end of the “service” we will hand you a self-addressed envelope. Certain volunteers are also equipped with credit card processing on their smartphones, if you choose to use a credit card to donate. Chaverim also accepts donations via our website, ChaverimLA.org. Our equipment and operating costs are funded solely by your generous donations. Chaverim’s non-profit status is pending with the IRS. Once approved, our status will be retroactive and any donations made will be tax-deductible from the date of our application, at the end of 2011. Q: How many calls does Chaverim go on? A: Some days Chaverim will get as little as one call and other days as much as 8 or 9. The average call volume is about 2 calls per day, using statistics through May 24, 2012. Q: Does Chaverim operate on Shabbos? A: Although other Chaverim chapters, such as Baltimore, operates on Shabbos, Chaverim of LA currently shuts its lines at candle lighting Friday and starts back up after the Motzei Shabbos zman (Shabbos out time). Baltimore Chaverim operates on the premise that a high percentage of their call volume is emergency related. Their Rabbonim have held that a child locked in a room as well as missing person searches (that have been classified as a critical missing) are docheh Shabbos. In the event of a “Chaverim Emergency” on Shabbos, we recommend calling Hatzolah. Hatzolah will be able to communicate with Chaverim on Shabbos, should the need arise. A) Chaverim is currently looking for several volunteers in the Valley Village. Additionally, as our call volume is steadily increasing, we are looking to fill two volunteer spots in the Pico/Robertson area. B) Please fill out our application to volunteer in “missing person” searches. The application is available on our website at ChaverimLA.org. Click “Missing Persons”. C) Another project we are working on is to locate as many resources as we can for utilization in a missing person search. For example, if you have access to a: boat, helicopter, fixed-wing aircraft, ATV, horse(s), or other valuable asset that can assist the community in a missing person situation, please contact us. D) Donate to Chaverim! Although Chaverim member’s pay for their own gas, we are still in need of purchasing additional equipment. Your donation will go directly to this worthy cause. E) Finally, Chaverim has launched a disaster awareness campaign. Our current fundraiser enables you to donate $180.00 to Chaverim. Your donation will entitle you to a set of five (5) LED lanters that last 150 hours on one set of batteries. That’s over two weeks of night time usage! More information is on our website. Visit ChaverimLA.org and click on Disaster Kits >> LED Lanterns. Chaverim often posts breaking community news as an incident is unfolding.